Akron, OH-The 2015 Summit Poll, conducted by the Center for Marketing and Opinion Research, found that Summit County residents think the most important problems facing the county are government and infrastructure issues, crime and safety concerns and issues around employment. For years, government and infrastructure issues such as road conditions and the water and sewer system only concerned between one-sixth and one-tenth of Summit County residents. In 2015, that number more than doubled with nearly 4 in 10 residents, 37%, citing these issues as the most important issue facing the county. While Crime and safety issues, such as too much crime and drug and alcohol issues, are the second most troubling to summit county residents, the number that find it troubling is similar to last year and down from 2013. 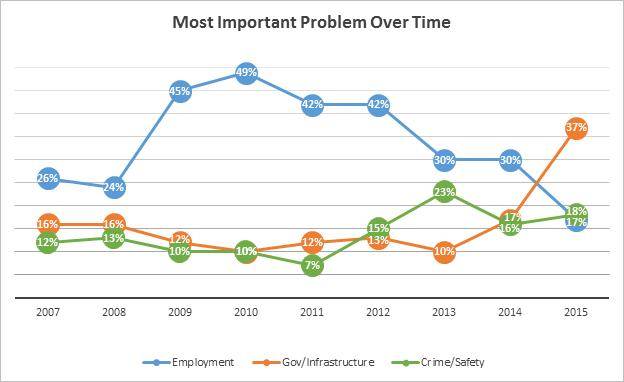 After holding the most important problem spot for the last 8 years, employment concerns such as not enough jobs and high unemployment were considerably less troubling in 2015 than just last year and significantly less than its most troubling point when in 2010, nearly half of Summit County residents, 49%, found employments issues to be the most important issue facing Summit County. Times are changing. The data included in this Press Release is from the 2015 Summit Poll with comparison data from 2007-2014. The Summit Poll is an annual telephone survey, conducted by the Center for Marketing and Opinion Research, which allows community organizations and local businesses with an interest in the opinions & attitudes of county residents to pose questions on the poll. It is an affordable way to collect key information as each participating organization pays for only those questions they choose to pose. The poll was conducted in March 2015 and included responses from 800 Summit County residents, providing a margin of error of +/- 4% within a 95% confidence interval. The Center for Marketing and Opinion Research (CMOR) provides public opinion research services to community based organizations. For more information, please contact Amanda Barna at 330-564-4211 or email at abarna@cmoresearch.com to speak with a member of our research team. The Center for Marketing & Opinion Research provides public opinion research services to colleges and universities, hospitals and healthcare organizations, and community-based organizations and government agencies. We measure what matters using telephone, web and mail surveys, field, intercept and key informant interviews, focus group administration, as well as a wide range of consulting services.